Wounds from centerfire rifles may be classified as contact, intermediate, or distant. Contact wounds of the head are the most devastating, producing a bursting rupture of the head (Figure 7.7). Large irregular tears in the scalp radiate from the entrance site. Powder soot and searing are typically present at the entrance. Rarely, virtually no soot will be present. In some contact wounds of the head, the entrance may be difficult to locate because of the massive destruction. Large pieces of the skull and brain are typically blown away, with pulpification of the residual brain in the cranial cavity. Pieces of scalp may be sheared off. The skull shows extensive comminuted fractures. Such wounding effects are due partly to the large quantities of gas produced by combustion of the propellant, emerging from the muzzle under high pressure. This gas begins to expand as soon as it emerges from the muzzle of the weapon. If the gun is held in contact with the head, this gas follows the bullet into the cranial cavity, producing an effect that can only be described as explosive. That the massive wounds produced are due partly to the gas can be deduced from cases of suicides in which the weapon used was equipped with a flash suppressor. This device, attached to the muzzle of military rifles, breaks up the "ball of fire" produced on firing a rifle at night, making the soldiers firing these weapons less susceptible to enemy counterfire. The flash suppressor disperses the gas emerging from the barrel through a number of slits in the sides of the suppressor. 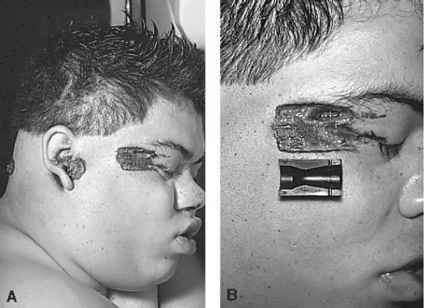 If an individual shoots himself with a weapon equipped with a flash suppressor, such that the end of it is in contact with the head, the flash suppressor will divert much of the gas emerging from the barrel before it has an opportunity to enter the cranial cavity. Thus, the wound produced by a weapon with a flash suppressor will be less severe than a wound produced by the same weapon without a flash suppressor. In contact wounds, the gas diverted by the flash suppressor may produce a characteristic pattern of searing and soot deposition (see Figure 4.13). Figure 7.6 (A) Full metal-jacketed 55-gr. .223 bullet bent at cannelure. (B) "Lead snowstorm" resulting from 55-gr. full metal-jacketed .223 bullets; .223 bullet bent at cannelure can be seen on x-ray. 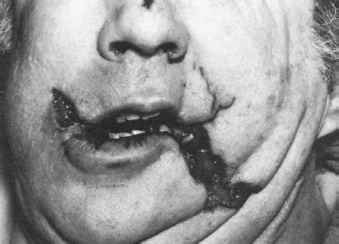 If a rifle is discharged in the mouth, massive wounds from the gas and the temporary cavity occur. Not uncommonly, lacerations of the corners of the mouth, the nasolabial folds, medial to the eyes, at the bridge of the nose and along the nasal ridge (Figure 7.8). 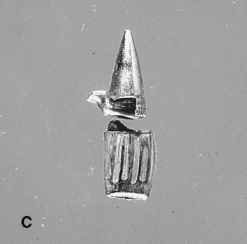 Figure 7.6 (continued) (C) Bullet tip and rectangular fragment of jacket; (D) "Lead snowstorm" 62-gr. bullet. 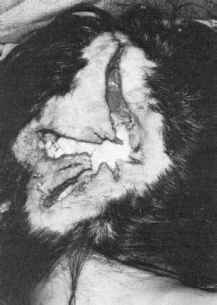 Figure 7.7 Homicidal contact wound of right temple from .30-30 rifle. due to the gas of combustion entering the chest and abdominal cavity, expanding in them, and slamming the chest or abdominal wall against the muzzle of the weapon. The fact that the whole wall is flung against the muzzle of the weapon by the gas, rather than just the skin as in head wounds, accounts for the fact that the skin is rarely torn. The outward moving chest or abdominal wall may envelop the muzzle to such a degree that the imprint of the front sight will be impressed on the skin even though the front sight is recessed a half inch from the muzzle of the weapon. In lever-action weapons with a magazine under the barrel, the imprint of the end of the magazine may be imparted to the skin (Figure 7.9A). While lacerations of the skin at the entrance in contact wounds of the chest and abdomen are rare, they do occur (Figure 7.9B). In contrast to their benign external appearance, contact centerfire rifle wounds of the chest and abdomen produce massive internal injuries. The severe nature of these wounds, due to both the effects of the gas and the temporary cavity, literally pulpify organs, such as the heart and liver. In contact wounds of the thorax or abdomen, the musculature surrounding the entrance may show a cherry-red coloration due to the presence of large amounts of carbon monoxide in the propellant gases. This carbon monoxide may follow the missile through the body and may also be present in the muscle at the exit. In one case seen by the author, the concentration of carboxyhemoglobin in the muscle was greater at the exit than at the entrance. 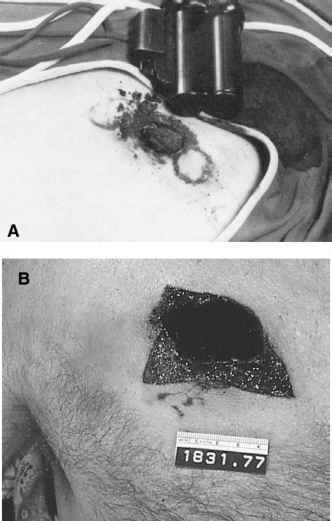 In intermediate-range gunshot wounds, powder tattooing is present around the wound of entrance. Intermediate range and distant head wounds, show a wide range in the degree of severity, depending on the style of bullet and the entrance site in the head. Anything that tends to produce instability, deformation or breakup of the bullet as it enters the head results in more extensive injuries. Thus, bullets entering through the thick occipital bone cause greater injuries than those entering the temporal area. 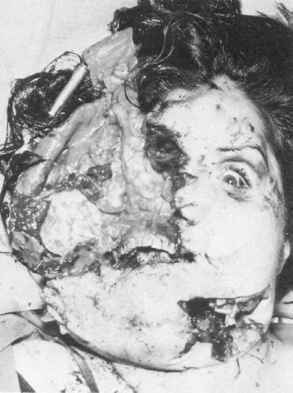 Intermediate and distant range wounds of the head can be just as devastating as contact wounds (Figure 7.10). This is especially true for hunting ammunition. As the hunting bullet rapidly expands, shedding fragments of core and sometimes jacket, large quantities of kinetic energy are lost in the cranial cavity. This produces a large temporary cavity with resultant high pressure, all within the rigid framework of the skull. The pressure produces extensive fragmentation of bone and brain tissue. Location of entrance and exit wounds may require extensive reconstruction of the skull, with careful realignment of the edges of the scalp and bone. Rarely, the entrance in the skin cannot be determined with absolute certainty. This is more common with exits, however. 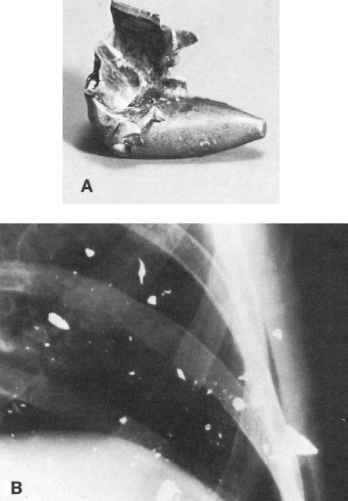 Figure 7.9 (A) Contact wound of chest from .30-30 rifle with muzzle imprint. (From DiMaio, V.J.M. Clin. Lab. Med. 3:257-271, 1983. With permission.) (B) Contact wound of chest with .30-06 with laceration of entrance. contact wound (Figure 7.11). This is probably due to the temporary cavity ballooning out skin that is tightly stretched over bone, with resultant tearing of the skin. Figure 7.10 Centerfire rifle wound of right half of head from .30-30 rifle. 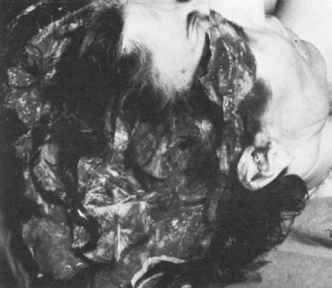 Bullet entered in back of head; ejected cartridge case can be seen in hair. Second gunshot wound of left side of neck. "micro-tears" radiate outward from the edges of the perforation. Micro-tears may or may not be found in association with an abrasion ring. Thus an entrance wound may appear as a round punched-out hole with micro-tears and no abrasion ring (Figure 7.12). Distant entrance wounds of the lateral aspect of the thorax from approximately the mid-clavicular line to the posterior axillary line may be unusually large. 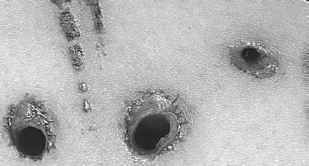 Like most distant wounds they are circular in shape, but the diameter of the entrance perforation can be up to 1 in. (25 mm) in diameter from a .30 (7.62 mm) bullet. The cause of this is unknown. Figure 7.12 Entrance wounds of back from centerfire rifle. Note absence of abrasion ring and presence of microtears. 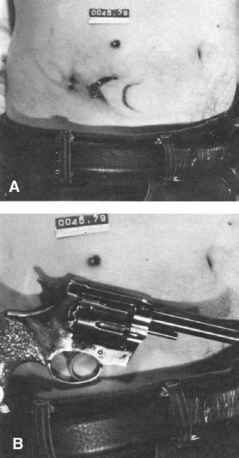 Figure 7.13 (A-B) Entrance wound from 7-mm Magnum rifle with patterned abrasions due to revolver tucked in waistband. outward by the temporary cavity with such force that imprints of clothing or objects lying against the skin will be imparted to it (Figure 7.13). Whatever the range, exit wounds of the chest and abdomen from cen-terfire rifle bullets all have the same appearance. They are larger and more irregular than the entrance wounds, with the majority of exit wounds 25 mm or less in diameter. The largest exit wound in the trunk that the author has seen measured 75 x 40 mm.